Villa Relax is located in a private park of 20,000 square meters of which 7,000 square meters are for the exclusive use of guests. The park is full of centuries trees and reaches the lake with access on the same. Has a private dock and buoy for mooring boats. In the garden, there are 2 Barbeques, Canoes, table tennis, net for volleyball, 3 hammocks ideal for an afternoon nap, sun beds and deck chairs to relax in front of the lake. The lake water is very clean and is perfect for a pleasant swim. Bikes are included. 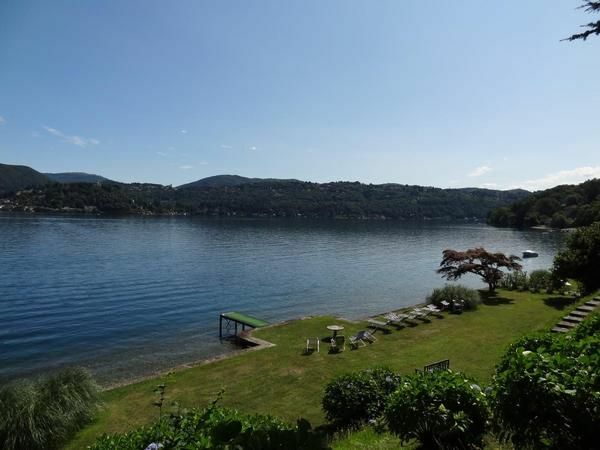 Hiking, biking, restaurants and agritourism, wine tours and visits of Orta, San Giulio Island, Mottarone (beautiful view from which you can see 7 lakes), Madonna del Sasso, Milan, Turin,Villa Taranto, Stresa and much more complete the holiday. Villa relax is the perfect place of a relaxing holiday. Orta, San Giulio Island, Pella and many more attractions are easily reachable by canoe, motorboat or public ferry. In San Giulio Island you can visit the Monastery, eat at the typical restaurants and during summer time attend classic concerts at Villa Tallone. Ten minutes walk from Orta you can visit for free the 12 chapels with statues in wood natural height depicting the life of St. Francis, Pella, Omega, Madonna del Sasso, Mottarone (where you can ski in winter times) will complete 'and enrich' your vacation. Come and relax in Villa Relax, spend an unforgettable vacation.